At 1073 feet above sea level, Knocknarea is a fine limestone hill standing between the bays of Sligo and Ballysadare. Perhaps it is for this reason it was given the name Knocknarea, Hill of the Kings, or perhaps the name Knocknarea signifies it is the King of the Hills – the tallest hill in Connaught. Knocknarea is also variously translated as the Hill of the Moon, Hill of Stripes, or the more menacing Cnoc na Riabh; the Hill of Executioners. The poet W.B. 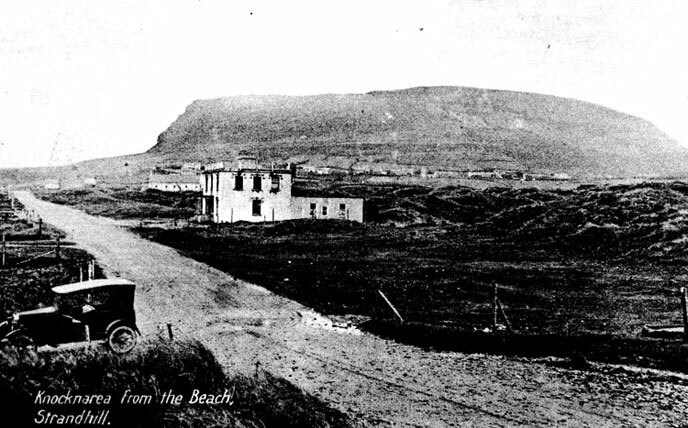 Yeats was fascinated with the beauty and legends associated with Knocknarea. which you cannot miss if you climb the mountain. The large chambered cairn on top of Knocknarea is nearly two hundred feet long and forty feet high and is known as Meascán Méadhbha – Meave’s Cairn. It is the largest unopened cairn in Ireland that is thought to conceal a neolithic passage tomb. The majestic Meascán Méadhbha is only one of a number of monuments on top of Knocknarea. These smaller tombs were severely damaged by the excavations of nineteenth century antiquarians. In general Knocknarea’s monuments are lined up North-South and face the Carrowmore tombs in the lowlands.